Enormous leaves shaped like violins make Fiddle Leaf Fig a dramatic accent. In its native habitat, this fig tree from the Moraceae family will reach 40 ft (12 m) tall. Fortunately, it grows very slowly and stays much shorter when grown indoors. Controlling its height is easy to do. Prune off the top of young plants to promote branching and to control its growth. You can also control its size by keeping it in a small container. You don't have to cut it back, though. The broad leaves of this fig tree make it a beautiful, live structural accent in a room with high ceilings. A few dwarf fig tree cultivars are available, including 'Bambino' and 'Little Fiddle'. Its bold, prominently veined leaves grow to 12 in (30 cm) long and 6 in (15 cm) wide with wavy edges. Keep the naturally glossy leaves clean by wiping them often with a damp cloth. This tropical native also loves to be misted. Repot only when necessary in spring, using the smallest pot that will contain its roots. Use a heavy container to keep it from toppling over. This plant can get top-heavy. Brown leaf tips are sometimes caused by dry soil. Use a container with a drainage hole and water the plant thoroughly until water drains out the bottom. This is the only way to be sure that all the roots are watered. If you just brought your plant home from the nursery and it dropped some of its leaves, don't worry. It's just adjusting to its new home. With good care, it'll grow new leaves. Leaf drop is fairly common with ficus plants, especially when they're moved to a new environment. Changes in light levels and temperature can cause leaves to drop, so it's a good idea to put your plant in a bright spot, out of direct sunlight and leave it there. Also keep it away from heat/AC vents or drafts from entryways. It may take a few weeks for your plant to adjust to a new place, so don't give up on it. While it may be tempting to repot, overwater or fertilize a shedding fig tree, don't do it. It'll only cause more stress to the tree and make the problem worse. A couple pests may invade figs trees. Scale are small brown insects that cling to stems and leaves, secreting a sticky residue on the plant. Also watch for webbing between branches and leaves, they're a tell-tale sign of a spider mite invasion. Although a bit fussy, fig plants make long-lived and beautiful indoor trees. Give your plant what it wants and you'll enjoy your Fiddle Leaf Fig for many years. Light: Give Ficus lyrata right indirect light year-round. Give your fiddle leaf fig a quarter turn every week or so to expose all sides to light. 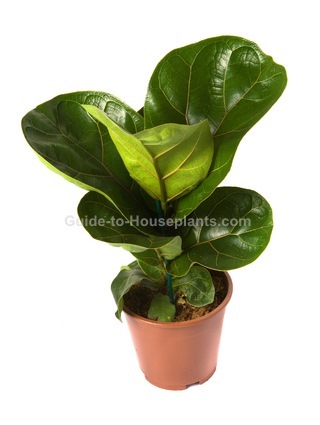 Like other ficus house plants, its leaves will drop if suddenly moved into low light. Water: Use a planter with drainage holes to avoid soggy soil, which can lead to root rot. Water thoroughly, then allow potting mix to dry out a bit before watering again. Drooping yellow leaves are a sign of overwatering. Humidity: Average room humidity (around 40-50% relative humidity). If indoor air is dry, you can increase humidity for your indoor plants. Fertilizer: Feed 3 times a year during the growing season (spring-summer-fall) with a balanced liquid fertilizer diluted by half. Propagation: Stem tip cuttings and air layering. Propagating large-leaf fig trees is not easy for the amateur to do at home. These trees are slow to root from either method.